When I opened my eyes, my head was still spinning and my stomach felt sour. I had tossed and turned all night from roiling dreams. What kind of promise could a day born in this state offer? But I didn’t suffer for long. I knew what to do. I thought small. Stephen has a show in a beautiful gallery in Laguna Beach, and last Thursday evening we attended the reception. While gallery visitors gathered around Stephen, asking him about his process and his relationship with the individual paintings, I shot photos of the event. Southern California was in the middle of a hot spell, and the gallery became so stuffy, I wandered outside to cool off. I’m glad I did. One of my favorite paintings hung in the large, front window of the gallery, and for the first time, I stared at the face in front of me, with no obligation to comment or pass judgment. I was free to look and allow my gaze to take me where it wanted me to go. After a bit, I found myself staring a triangle of cracks near the subject’s left eye. How exquisite I thought. All those tiny striations moving from her eye toward her nose. They might be tears rolling down her face. Or bits of images reflected back onto the world from her eye. And within that arrangement of cracks, the smallest triangles of the same pale orange and aqua Stephen painted throughout the rest of the painting, concentrated here, as if what the young woman observes is impacting her. 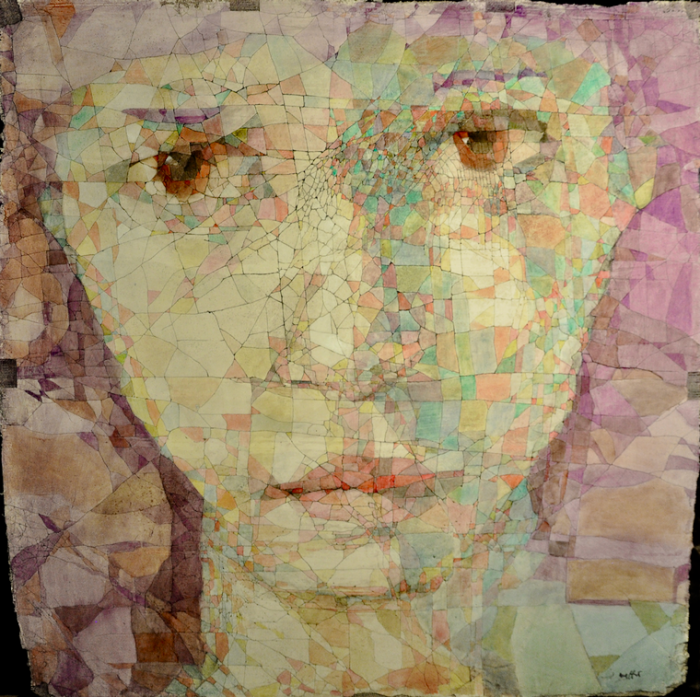 As if the thoughts in her head and the images observed by her eyes have come together in this small triangle of cracks and colors, and Stephen has discovered a way to capture this fusion of image and thought, or image and response in his art. As I conjured this one moment within a much larger painting, concentrating on the hair-line cracks and the tiny triangles of color, I could almost feel Stephen’s light touch on my skin, the tap tapping of his finger pads and the brushing of his finger tips on me echoing the tap taping and brushing of his fingers on the painting as he created it, smoothing out a triangle of pale orange here, brushing on a spot of aqua there. When it was time to hop out of bed, the nightmares had disappeared completely, replaced by one small moment in a painting created by my husband. And as I made the bed and tidied the bedroom, I could still feel Stephen’s tender fingers on my skin. Such a lovely “small” story and such a lovely painting. Thanks from both Stephen and me! Thanks, Assunta. So lovely mohave you in my close audience. Happy Adorable Assunta day!